Perfect Pendulum (Rod) Golf Teaching Aid The Perfect Pendulum is a versatile golf swing training aid with a telescoping attachment improves virtually every aspect of your golf game. Learn how to make a pendulum putting stroke, a tried and true chipping motion and an on-plane swing. The Perfect Pendulum is easy to use and includes a step-by-step instructional brochure. The compact size and free carrying pouch make it easy to put in your golf bag and take anywhere. It’s great for practicing indoors or out, and is ideal for pre-round warm up. Putting: The Perfect Pendulum teaches you to make a smooth pendulum putting stroke with your own putter. 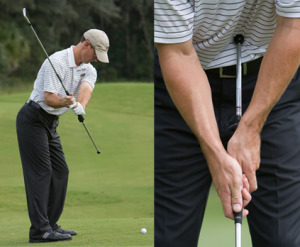 The end creates a fulcrum, or pivot point, and allows the putter head to make a consistent arc throughout the swing. Simply adjust the Perfect Pendulum so the end lightly touches your belly and then make a stroke while keeping the end in contact with your belly. Chipping: Trying to scoop the ball or allowing the wrists to break down can lead to skulled, chili-dipped and generally lousy shots around the green. The Perfect Pendulum teaches you to keep your hands ahead of the club while chipping and the end result is an improvement in consistency and accuracy. Attach the Perfect Pendulum and extend it to its fullest length. If you try to scoop the ball or if your wrists break down after impact you get instant feedback when the Perfect Pendulum makes contact with your side. Full Swing: The Perfect Pendulum can be a useful tool to monitor and improve your swing regardless of the swing keys you use, what style of swing your professional teaches, or even if you are self-taught and donâ€™t practice that often. With it you can easily check the position of your club throughout your swing. When attaching the Perfect Pendulum it should be in direct alignment with the clubâ€™s shaft and the strap should be tight. May be used right or left-handed. If you have any questions regarding the Perfect Pendulum Golf Training Aid, please give us a call, we would be happy to help you with any questions you may have. Write an online review on the Perfect Pendulum Golf Training Aid, and share your thoughts with others.